Each spring the Black grouse (Tetrao tetrix) congregate on their ancient leks, to determine who carries the best genes for the continuation of the species. It is a wonderful spectacle to witness, and something that most people will only ever see on pictures, because the leks are hard to find, and even when you know where to find them it’s a game of patience to get to see and photograph. 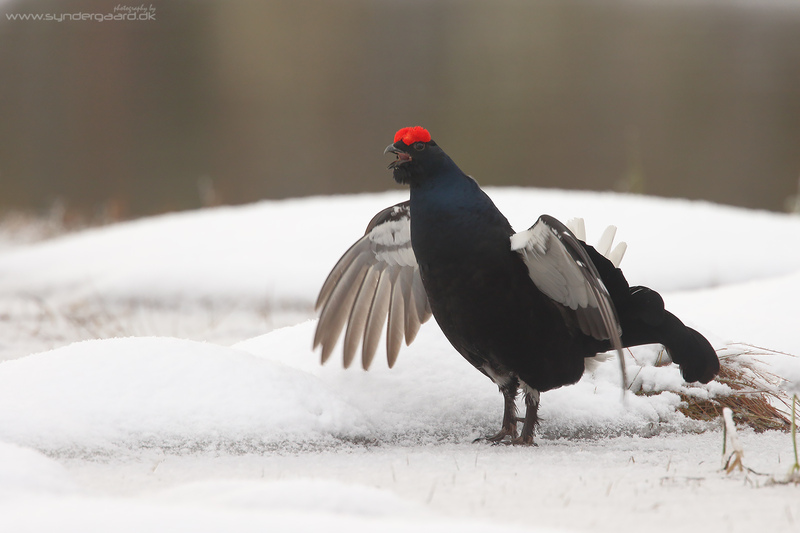 The Black grouse is extinct in Denmark, but still relatively common in some areas of Sweden and Norway – so three friends went across to visit the lekking birds, and try to photograph them. I came home with several thousand images of lekking grouse, and many more of other, equally sought-after species, and have been hard at work trying to sort through them and finishing a few. This blog post contains the best of what I have found so far in the grouse folders. Shooting predominantly black birds on snow is a thankless endeavour; either the snow blows out, or the black is underexposed. It requires quite some post-processing to get the highlights and the shadows to both contain some definition, and in many cases it just isn’t possible (with my skills anyway). But I’m super pleased with the images all the same, and still have all the RAW files in case I learn more post-processing skills and would like to go over these one more time. The Grouse do all their fighting around dawn, and up to a few hours into the morning hours. In order to avoid disturbing them, the photographers generally spend the night at the lek, placing the hides in the evening and sleeping in there, carefully avoiding noise of excess movement even when the action starts. The birds arrive while it is still dark, and announce their presence with loud, melodious calls and much flapping of wings. As the light increases, so does activity on the lek – unless the Goshawks are on the prowl, in which case nothing happens… Around mid-morning the show is over, and an hour or so later the photographers may pack up and go home for a meal, before heading out in the afternoon for more of the same… We had rented a little cabin in the woods, but ended up spending just 3 nights out of 12 in the cabin – the rest were spent in hides in the snow. It has to be the finest form of vacation anyone has ever invented 🙂 even if flying a paraglider comp comes close. Near the lek shown in these pictures we saw Lynx pawprints in the snow, and on another night a Lynx walked through the woods near by, calling as it went. On another night the wolves were howling – does it get any better? I can’t wait to go back! Note how the excitement has caught even the meek gender – she’s all puffed up. There’s much sizing up of one’s opponent going on. She pretends it’s nothing to do with her.